Featured Song "Stomp My Name on the Walk of Fame"
"Dadzilla" is the ninth episode of The Adventures of Super Mario Bros. 3; it aired alongside another episode of The Adventures of Super Mario Bros. 3 entitled "Tag Team Trouble". Kootie Pie is applying makeup when she hears King Koopa coming to see if her room is clean. He warns her that if her "pigsty" that she calls a bedroom is not yet clean, she will be grounded. She hides the mess in her wardrobe. It at first seems to be clean, but when everything drops out from it, Koopa is not fooled and he grounds her, which infuriates her. Kootie Pie complains about having a rotten father, and just as Big Mouth intrudes, Kootie Pie figures that Koopa must not be her real father. The two also decide that their father must be someone magnificent, like a movie star. Meanwhile, Mario and Toad are searching for a Fire Flower when the Doomship collides with them. Mario and Toad tumble right into a patch of Fire Flowers, but soon notice the Doomship. It is revealed that the two Koopalings are trying to pilot it (which is why they crashed into Mario) and arguing over which way leads to Hollywood. The Doomship flies into a Warp Pipe, but not before ripping the roof off of Toad's house. Luigi and Princess Toadstool run out and Toad explains what happens. The group decides they must follow the Koopas. 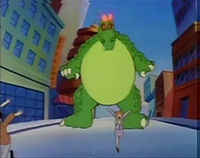 In Hollywood, Kootie Pie and Big Mouth find themselves amongst the Walk of Fame, when a giant reptilian monster named Madzilla appears from behind a building. They decide that the monster must be their true father, only to see a film director turn the monster off with a remote control. Still believing Madzilla is their father, the two try to help Madzilla with their magic scepters. Once he wakes up, he scares off the confused director and places the Koopalings on top of a building. Big Mouth explains how Madzilla put them up for adoption (or at least their beliefs thereof) and they request Madzilla get them a convertible. Instantly, Madzilla takes a car off the road, rips off the roof, places the "convertible" on the roof, and sticks the two Koopalings in it. However, they tell him it's not good enough, and so begins their long line of demands from him. Mario and his friends appear out of a Warp Pipe. Meanwhile in a separate area of Hollywood, Mario, Luigi, Toad, and the Princess pop out of a Warp Pipe in a sewage area. Mario tells the gang to follow him until they see Dadzilla storming through the city. Kootie and Big Mouth then catch Mario out of the corner out of their eye, and Kootie Pie tells them about how they did "terrible things to [them]". Madzilla grabs Mario by his overalls, when Mario remembers his Fire Flower. 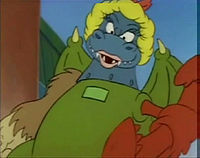 He burns Madzilla's hand and gets ready to fight him, when Kootie Pie decides that Madzilla needs help and wears Mario's powers away with her scepter. The gang is chased by Madzilla into a props garage, but the Koopalings announce bigger things to attend to: their becoming of movie stars. While Kootie Pie, Big Mouth, and Madzilla put their feet in the cement in the Walk of Fame, Mario explains an idea of his to the gang. He points out a large head that greatly resembles Madzilla - or at least a female version of him. Luigi recognizes it from the monster movie "Revenge of Madzilla's Mom". Mario then tells them that they can rebuild Madzilla's Mom to counter the Koopas. 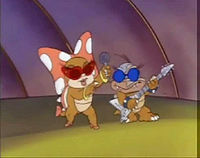 Kootie and Big Mouth performing the concert. Madzilla tries to catch up on his rest when Big Mouth and Kootie Pie tell him they want to perform a live concert for everybody in the Hollywood Bowl immediately. Somewhat annoyed, Madzilla heads for the Hollywood Bowl, pulls it out of the ground, and places it over Big Mouth and Kootie Pie. They then begin playing "Stomp My Name on the Walk of Fame". The audience hates it and throws assorted objects at them, like catapulting various items off of a palm tree, and then throwing the palm tree at them. The Koopalings manage to dodge most of the items thrown at them until the end of their performance, at which point they are both hit. Back in the props garage, Mario activates Madzilla's Mom, which is crudely built out of several monster body parts. It takes off to find Madzilla, as the gang watches. The Koopalings are now buried in garbage thrown at them. Kootie Pie crawls out and screams at Madzilla. He tries to cheer for them, and the audience directs their garbage at him. He attacks the audience for not cheering, when his "mother" appears. She (really Mario) tells Madzilla to put the people down, when Kootie Pie objects, telling him he's only supposed to obey them. Madzilla's Mom looks down at the two Koopalings, then tells them it's time for their nap, and then, chores. The Koopalings think about how their life back home was much better, and retreat back to Dark Land. Mario (still in Momma Madzilla) leads Dadzilla to the now destroyed props garage, and explains how he was once a robot. The Princess tells him that he will be free to live in Giant Land, and, best of all, he won't have any kids to deal with. During a certain shot while performing "Stomp My Name on the Walk of Fame", and a scene when Kootie Pie and Big Mouth say "We hate naps! ", Kootie Pie's entire head is the same color as her skin. When Mario and Toad roll into a Fire Flower, it is blue like an Ice Flower instead of orange. When Kootie Pie and Big Mouth are dancing and exclaiming that Dadzilla must be their true father, both of their shells turn green. When the Doomship nearly crushes Mario and Toad, it is colored gray. When Kootie declares her real father must have a star on the Hollywood Walk of Fame "just like this one", she is standing on a normal sidewalk, pointing to nothing. The correct background appears a moment later. In the scene where Mario says that Kootie Pie and Big Mouth need to take naps, a glitch occurs on the DVD, causing the image to look like an old VHS tape. There are no audio dropouts, just an image glitch with the master tape. Before Mario gets picked up by Dadzilla, his scream is an archival audio clip of Lou Albano from the Super Mario Bros. Super Show! episode, "The Great BMX Race". When Kootie Pie and Big Mouth say "You have to do what we say!! ", they just freeze. When Kootie Pie is complaining the she has a mean father, her reflection was not present in the mirror. The wall of Kootie Pie's room is shown purple, but when Big Mouth comes in, it is shown tan. When Big Mouth says "Let's go find him!! ", one of the spots on Kootie Pies bow flashes blue and also her head is shown scooting over a little bit. This also happens when Kootie Pie tells Madzilla how Mario and his gang are. When The Doomship is about to crash into Toad's house, a part is missing on the Doomship. When the Doomship is about to crash into Toad's house, his house is colored in, but when it hits it, it is shown all orange. When the episode first shows Hollywood, Big Mouth's shell is green. When the people are running past Kootie Pie and Big Mouth, they are shown repeating. When Kootie Pie is asking the Madzilla what's wrong, Big Mouth's star is shown more likely to a diamond. When Kootie Pie are congratulating Madzilla for scaring the director, Kootie Pie's bow is inflating. In some shots of this episode, Madzilla has dark skin around his eyes. When Big Mouth is telling Madzilla that he wants a car, Kootie Pie is blinking to much. When it showed the cars driving, the cars were repeating. When Madzilla says "Streeeetch Limo!? ", his eyelid flashes. 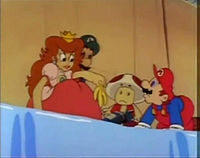 When Mario tells Princess Toadstool that theres no time to admire the scenery, Toad is shown with pupils. When Kootie Pie says "Soon to be the miserable brothers!! ", her shell turns white. When Kootie Pie tells Madzilla how mean Mario and his gang are, Big Mouth's head was brown. When Fire Mario shot a fireball at Madzilla, he was shown transforming back into normal Mario for a millisecond. When Mario tells Luigi, Princess Toadstool, and Toad to run, Toad's shoes are the same color as his skin, Mario's head messes up, and Luigi's hair flashes from black to brown. When Kootie Pie and Big Mouth are singing, a guy throws a white box at them, but in the next shot, it is tan. The same thing happens when the other people throw boxes. A guy shoots liquid at Kootie Pie at the end of the song, when it comes out of the bottle, it is orange, but when it hits Kootie Pie, it is yellow. When Kootie Pie and Big Mouth come out of the garbage, the Hollywood Bowl is not shown, but in the next shot, it is there. When the people are throwing things at Madzilla, the people are flashing. In some shots of this episode, Kootie Pie's eyes are black instead of blue. When Madzilla is telling the people to cheer for the shrimp at the bottom of the ocean, his snout is flashing. German Der richtige Vater? The right Father? 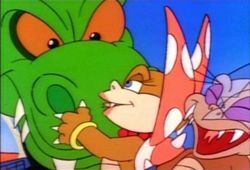 This episode had Kootie Pie and Big Mouth state that King Koopa must not be their real father, long before Shigeru Miyamoto stated in the press that the Koopalings are not Bowser's children. This page was last edited on March 22, 2019, at 11:19.